I love this beautiful bar cart my parents gave me. It has top and bottom shelves, both of which are leather covered. It has a wine rack just below the top shelf. I really love it. But I’m not a big drinker, so going full bar-cart never seemed to be the right fit. Instead I have always styled the cart for the current season. After updating some dark colored candle sticks with white and gold gilding, I added a spring vase, and a piece of Mikasa stoneware. 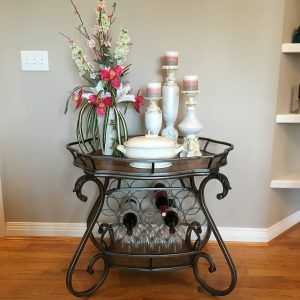 The wine rack stores a few bottles of wine, and the bottom shelf houses my Mikasa wineglasses. I love how these few updates refreshed my bar cart and helped get my dining room ready for spring. To see how I refreshed the candlesticks, as well as a before look at them, please click here.